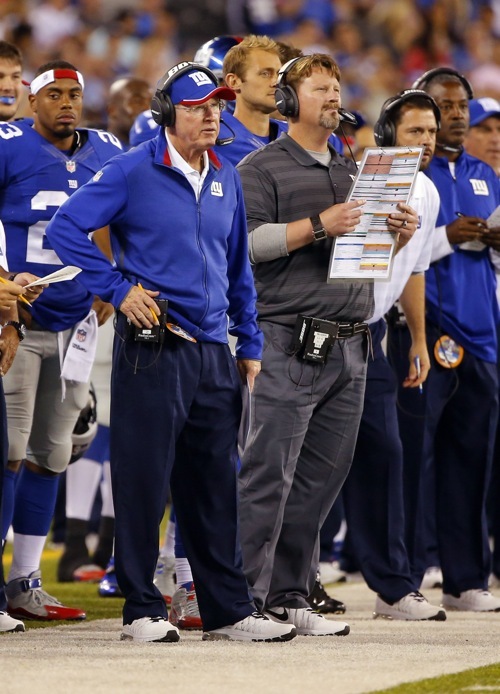 It’s been awhile, but Tom Coughlin still remembers what it was like to call plays. To stand on the sideline and play the game of chess versus the opponent’s defensive coordinator, working tirelessly to find the perfect play on that laminated sheet to counter a play you’re not certain the defense will run. Just as much as any of that, Coughlin remembers what it was like if anybody tried to walk up to him during a game and offer advice in the middle of drives drives. It’s that reason why Coughlin will let new Giants offensive coordinator Ben McAdoo do his thing Monday night in Detroit. 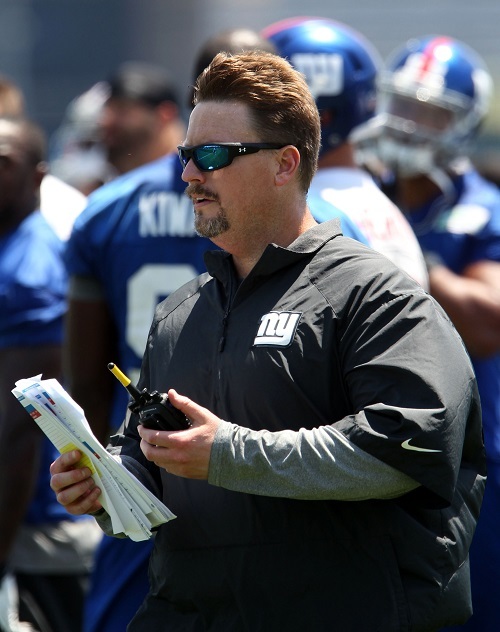 If the first-year play caller needs help, Coughlin will offer, but for the most part, McAdoo will be left alone. For the first time in over a decade, the Giants will open the season with a far different offensive scheme than the one that helped the team capture two Vince Lombardi trophies within the last eight years. Gone is Kevin Gilbride’s long-developing, read-the-defense, vertical passing attack. In it’s place, McAdoo’s quick-hitting West Coast scheme. 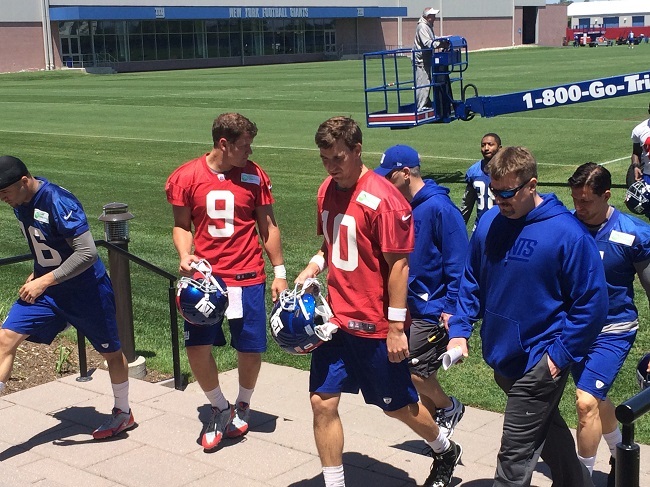 The offense is designed to get the receivers the ball in space, move the pocket and have quarterback Eli Manning put the ball into tight windows. No longer are there many seven-step drops. Instead, three-to-five before Manning is supposed to hit his back foot and fire away. During the Giants five preseason games, the offense has displayed glimpses of what the offense can do when clicking on all cylinders. There was a long two-minute drive versus the New York Jets in the third preseason game, a 73-yard touchdown run by Rashad Jennings versus the Pittsburgh Steelers. But in between each solid play were four-to-five negative ones. Three-and-outs, sacks, rushed throws and miscommunications marred the Giants preseason. Fans and critics went running for the George Washington bridge, Coughlin, Manning and McAdoo for answers. Come Monday night versus the Lions, Coughlin hopes it much more good than bad. Standing in the way of a New York offensive showcase? A talented Detroit defense led by standout defensive tackle Ndamukong Suh. Keeping Suh off Manning? An injury-depleted offensive line with far more question marks than answers. “Obviously, it’s a big challenge,” Coughlin said. “They’re an outstanding defensive team and an outstanding defensive front with exceptional players. That having been said, we’re well aware of that.